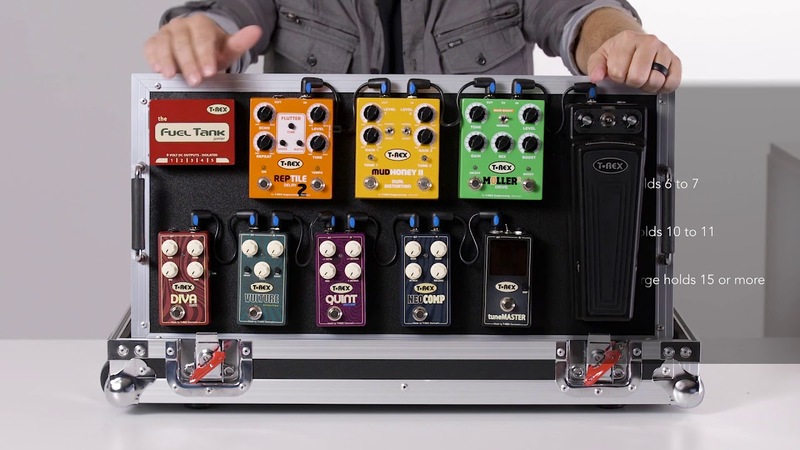 Stomp box security is tighter than ever with the G-TOUR PEDALBOARD-LGW large pedal case exclusively from Gator Cases. Plywood fabrication and aluminum edging combined with Heavy-duty Gator signature red hardware offer rock-solid protection. The 3M “Dual Lock” ™ fasteners make installation a breeze together with Gator’s removable 24″x11″ pedal board surface. Pedal protection continues with Gator Cases’ pro-grade shock absorbing EVA foam interior. Even your connecting cables, picks and accessories stay neatly organized in the lower portion of the G-TOUR™ case. Pedal transport is a breeze on the ground or in the air with convenient retractable town handle and inline wheels. The ATA-rated G-TOUR PEDALBAORD-LGW large pedal case from Gator is literally ready to rock and roll! Removable pedal board surface 24" x 11"
Meet your new favorite case.